Home » Why Isn’t Your Air-Conditioner Blowing Cold Air? Air conditioner not blowing cold air is every homeowner’s nightmare. With summer temperatures hitting an all-time high and the AC doing absolutely nothing about it, you can just imagine how terrible the situation at your home can be. But what could be the cause of this problem? Well, you need to figure it out because there are many reasons why your AC is unable to cool the house. We’ve rounded up some of the main reason for air conditioners not cooling. One of the biggest reasons why your conditioner unit is not cooling the house is an unmaintained or dirty condenser unit. This the unit of the air con that is installed outdoor and that is why in most cases, it is neglected when it comes to maintenance. So when dirt, debris start building up or weed and grass start growing around, it becomes difficult for it to work efficiently. Luckily, you can clean up the condenser unit on your own. Clear the bushes, weeds, grass, and trees around it. For the debris use soap and water clean then, and your unit will start blowing cold air. If there is not enough air coming through the vents, then it is impossible to cool the. Note that for the air conditioner to cool the room, the unit has to pump cold air in the house. If it is very hot, then the cooling system works harder to pump more cool air into the house to keep the room cool. Therefore, if there no sufficient flow of air, then you will have a problem keeping the room cool. You can tell if there is enough airflow holding the light on the end of the vents. Dirt or clogged filters are usually the problems. So you just to replace the filter. If that doesn’t work, contact a Sutherland Shire air conditioning service provider for air conditioner repairs and professional help. Before you even think of contacting a professional air conditioning service provider in the Sutherland Shire, Cronulla, Illawong or Heathcote areas, check the batteries in the thermostat. This is the devices that control the cooling system by setting the temperature of the air blown in the house. If the batteries cannot power your thermostat, then you will have the air conditioner not blowing cold air but running. Therefore, change the battery first and see if the air con will start blowing cold air. In addition, there are other thermostat issues such as circuit malfunction or settings that could be causing the problem. This may sound weird but could be the reasons for the air conditioner not cooling the house. If you have replaced the filters and still the problem does not go away. Then, you need to check the evaporator coils. They could be frozen and hence making it impossible for the unit to cool. When the coils are covered with ice, it means the air blowing into the house does not come into contact with the refrigerant to cool off. Just switch off the AC unit for at least 24 hours to allow for defrosting. If that doesn’t work, we recommend professional air con servicing to handle defrosting. Low refrigerant is one of the problems that are difficult to identify. 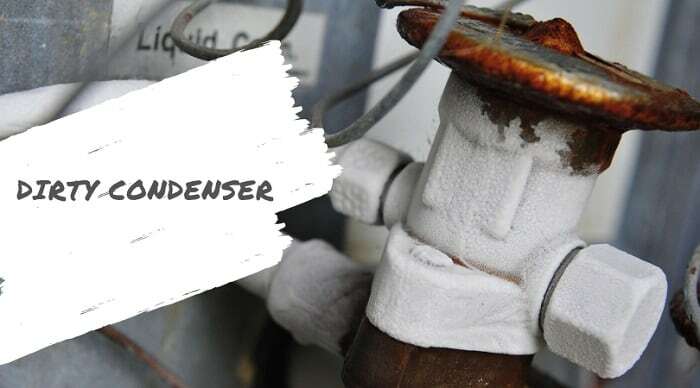 Although the manufacturer’s manual may provide timelines when you need to have the refrigerant or gas refilled, leakage could occur before then. That may be the reason for air conditioner not blowing cold air but still running, yet you can’t find any visible cause. The solution is to contact a professional air conditioner service provider to fix the low refrigerant. If you find air con not cold after a regas, then brace yourself for a bigger problem. The refrigerant is one of the main components in the cooling process. It is the fluid that absorbs the heat in the outdoor air to cool before it is blown into the house. For the air cooling to be effective, the right amount of refrigerant must be maintained. If there is a leakage, you will not have enough refrigerant to absorb the heat in the air. That could be the reason why your home is warm, yet the machine is running. 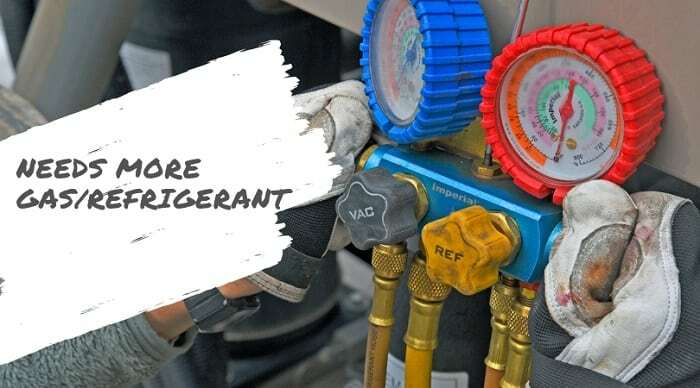 If you hear a hissing noise, icy build up on your air conditioner or the unit is taking too long to cool the air in your home; there is a high possibility that the refrigerant is leaking. Contact a professional, licensed HVAC company to help fix the problem. If none of the above have fixed the problem, then you need to take into consideration the issue of the hardware of the unit. Like any other machine, air con units are prone to wear and tear. Therefore, you need to check the condition of each part of the unit for mechanical issues. Check if the compressor, cooling coils, and other parts of they are defective. You also need to check your filter and thermostat for mechanical damages. These are just a few of the areas that would make it impossible for the unit to blow cold air if they are faulty. Last but not least is improper installation. If you installed your air conditioner recently and it turns out that it is not blowing cold air into the house, you need to have the installation work checked. Probably, there was a problem, or the work was handled by an inexperienced HVAC service provider. That is why we always recommend that you get professional air conditioning installation to avoid such cases. If the problem is improper installation, hire a reputable air conditioning specialist to handle the job. 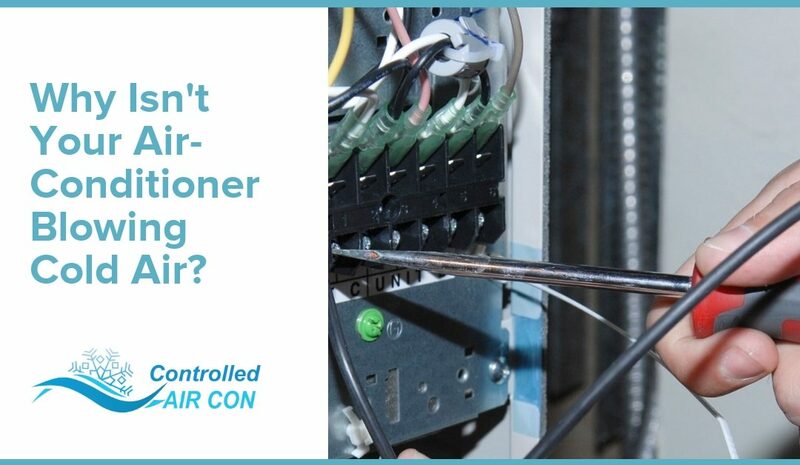 If you have problems with your air conditioning unit in the Sutherland Shire and its suburbs, contact Controlled Air Con. They are reputable air conditioning specialists boasting highly experienced technicians that can fix all aircon types. Their quality of service and reasonable charges are unparalleled.